Do You Want to Improve and Master Pull Ups? "Today was the day. No more bands, no more iso holds, no more eccentrics. It was time for the real thing. She approached the rack with a little zest (not entirely sure what song she had just listened to), stepped her way up to the pull-up bar, and grabbed hold for the ride. Following a big breath and brace, she pulled as hard as she could and glided right up, pure euphoria spreading across her face as her chin passed the bar. I thought she was going to perform a back flip off the rack. Instead she hopped down and gave me a huge high five — she had just crushed her first pull-up. As trainers, it’s important to first ask the right questions and then move our clients down the path towards their goals. Many times, one of those goals will be to either do a single pull-up or just crush pull-ups period. While the pull-up might look simple, it’s anything but that. There are many intricacies to be aware of if you hope to help your clients how to master pull ups. 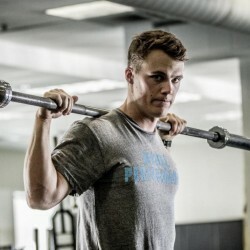 This article will walk you through everything from clearing someone to do a pull-up, to the biomechanics behind it, to the execution, programming, cueing and everything in-between..."